See the above contraption? What do you suppose it is? Any guesses? Well, would you put your foot in it? 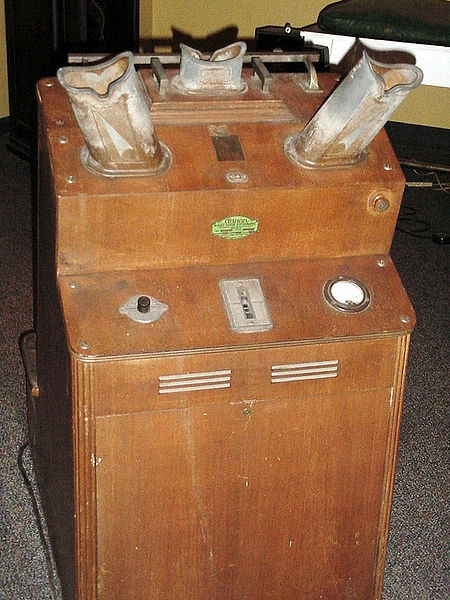 My MIL recently told us that this was an actual devise used in shoe stores to provide an X-ray of one’s foot – and indeed to check to see if there was enough room for toes inside a shoe. I kid you not. Not sure what was wrong with the method of just pushing on one’s toes through the shoe to gauge, but yes. These were used instead. Apparently, they were known as pedoscopes and were popular in the U.K. through the mid-1970s. I’ve never seen one, never heard of one, but my MIL has reported that my husband’s foot was pedoscoped back in the day! Wikipedia also reports that they were also used in the U.S. from the 1920s through the 1950s until they were outlawed (probably due to all the pesky radiation! What a buzzkill! ).